The Bureau County Sheriff’s Office tried creating a public scare, but the evidence against their claims tells another story. First of all, the report claims it was one candy bar, but the picture showed four. Google image search of the candy pic turned up only articles related to the Bureau Sheriff’s claims. I could find no candy listed by that name, either. Odd. So I looked closer. Turns out, I didn’t even need to look that close. There are clearly Japanese characters printed on the candies. Japan is even more strict about marijuana and other drugs than America, so there is almost no chance whatsoever that some Japanese cannabis candy made its way to rural Illinois and into trick or treat bags. The marijuana leaves on them? Those are Japanese maple leaves. They are a popular design image, and do rather look like marijuana leaves. But the sheriff claimed they actually tested the candy. Did they? Did anyone actually report the candy? Why were no names given? Often in cases like these, the police and media will parade the family around for some good public moralizing. But in this case we were given a public statement and a Facebook post. Don’t seem fishy to you? Is this the long-awaited evidence that malevolent strangers really are trying to get your kids high by slipping marijuana edibles into their trick-or-treat bags? Nope. As an eagle-eyed blogger pointed out at Dankspace.com, the picture accompanying Reed’s press release shows Japanese candy bars sold under the brand name Iroha Kaede, which is a kind of maple tree. 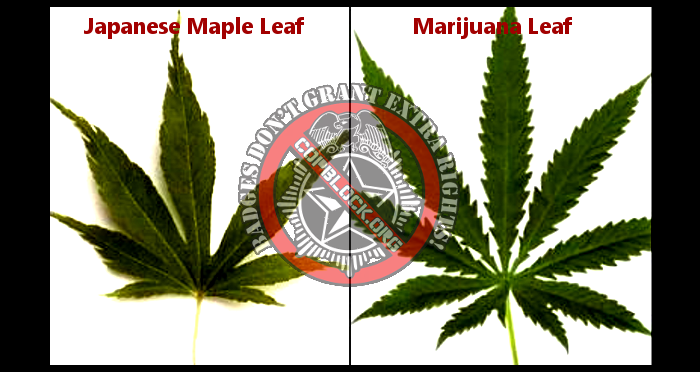 That’s right: Those “small pictures of cannabis leaves” are actually small pictures of maple leaves. If the candy bar really did come up “positive for containing cannabis” in a field test, that just shows how unreliable such tests are. Yet despite all of this, there has been no retraction from the BCSO or the media who reported on it, as of this writing. Was it just an unreliable test? I somehow doubt it. But even if so, releasing it as a statement of fact without further investigation, was highly irresponsible. Are they lying, or am I just a superior investigator to the BCSO employees? Either way, this kind of thing cannot stand. The War on Drugs has been the most disastrous legal experiment in American history. Those who add to it through intentional propaganda or careless, irresponsible police work should have to answer for their incompetence and/or lies. You can also use the Illinois State Police contact form to request that they investigate a potential crime in the falsification of evidence, or inciting a public panic. Or hey, maybe you wanna contact the the office of Illinois State Governor Bruce Rauner. Whatever you do, take this opportunity to have a voice and fight back directly against the purveyors of this dangerous propaganda.